Newly discovered dinosaur footprints in southwestern Arkansas offer scientists a peek back in time. Beads of sweat form on geoscientist Steve Boss’s face and trace tracks through sunscreen as they travel down his neck. From beneath his hard hat and behind his safety glasses, he surveys the grey field of rock surrounding him, heat radiating off bleached limestone in the southwest Arkansas landscape under the midday sun. He and his colleagues have been laboring since before sunrise at the research site, and the thermometer now reads 106 degrees Fahrenheit. He takes a swig of water from a plastic bottle, working hard to stay hydrated; yesterday one of the researchers almost succumbed to the heat, so the team has redoubled its efforts to stay cool. As they did the previous day, the scientists will work for another six or seven hours in the humid, hot temperatures of a July day. But the scientists aren’t thinking about the uncomfortable conditions or the long hours – their minds are focused 115 million years in the past, back when dinosaurs walked through Arkansas. 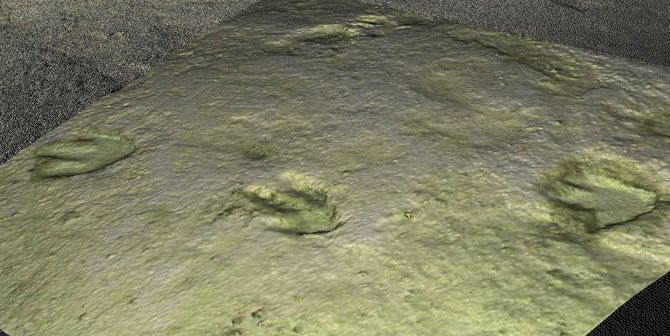 Researchers for the Center for Advanced Spatial Technologies used a laser scanner placed on a cherry picker to create high-resolution images of the dinosaur tracks imprinted at the site. “This looks like a claw,” says graduate student Brian Platt. He points to the end of one of three distinct grooves in the rock as he and Boss lean closer to the giant impression in the chalky ground. The footprint is large enough that a collie could curl up in the center of it. It is one of hundreds of footprints of different shapes and sizes that pepper the terrain around the now prone scientists. The tracks face in all directions, criss-crossing back and forth, some on top of one another. Researchers Steve Boss of Arkansas, standing, and Brian Platt of the University of Kansas use simple tools such as a pole, a tape measure and a notebook to measure the size of tracks and the distance between them. They will use these measurements with the information from the laser scanner to gather information about these animals and their surroundings. Boss sets the scene, for the writer, his hand sweeping to encompass the barren landscape: 115 million years ago, this area bordered the edge of the continent, and the whitish ground we stand on was part of a shallow coastal mud flat. Boss likens the climate and surroundings at that time to the Persian Gulf today – hot and arid conditions with very salty water and no real vegetation to speak of. “It was a place that you wouldn’t want to spend much time in,” Boss says. Despite the harsh conditions, many dinosaurs walked through this area. Prints found include those of sauropods – giant, long-necked plant-eating dinosaurs – as well as predatory theropods, probably Acrocanthosaurus atokensis, one of the largest carnivorous dinosaurs to ever walk the earth. The discovery of dinosaur footprints provides as much excitement to scientists as skeletons do, says Platt. 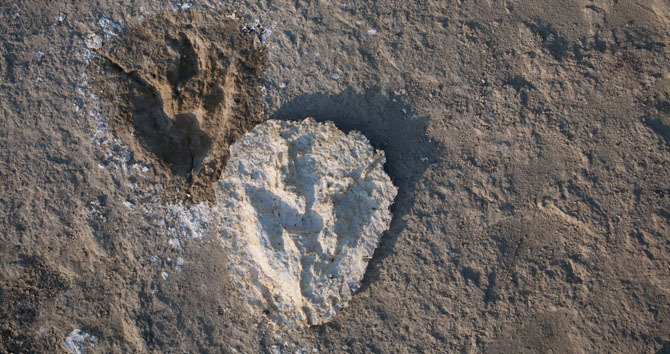 Scientists can use footprints to learn about animal behavior as well as biology – where did an animal go, how did it walk, how much did it weigh. How can scientists guess the height and weight of an animal that lived so long ago? To do this, Platt and others study modern-day living creatures. While Platt examines the print of a plant-eater, Boss follows a set of three-toed tracks made by a giant predator. The space between the tracks spans such a distance that a person can’t jump from one footprint to the next. After following the steps for a few hundred yards, Boss stops and points to two tracks side by side. “It looks like this animal stopped here,” he says. The researchers’ excitement at seeing the tracks firsthand is tempered by the need to act quickly. Their access to the site is limited to two weeks, and they will not be able to return. The team of researchers, which includes scientists from the University of Arkansas, the University of Kansas and Boise State University have a fast-track grant from the National Science Foundation to collect as much information from the site as they can before time runs out. To accomplish this, the researchers have brought an array of tools with them: picks and whisk brooms, measuring sticks, notebooks and pencils, and laser scanners. Wait – why bring a laser scanner to a field of footprints? Cue Jackson Cothren and Malcolm Williamson of the Center for Advanced Spatial Technologies at the University of Arkansas. Boss asked Cothren and Williamson, who have used laser-scanning technology to map World Heritage sites including Machu Picchu, to apply their work to the dinosaur tracks. The researchers are using a high-resolution scanner perched atop a cherry picker to create a precise digital map of the location of the prints within the landscape. The technology not only allows measurements of the prints themselves within six millimeter accuracy, but it also maps the prints in relation to one another – something that could take months to do using old-fashioned techniques. 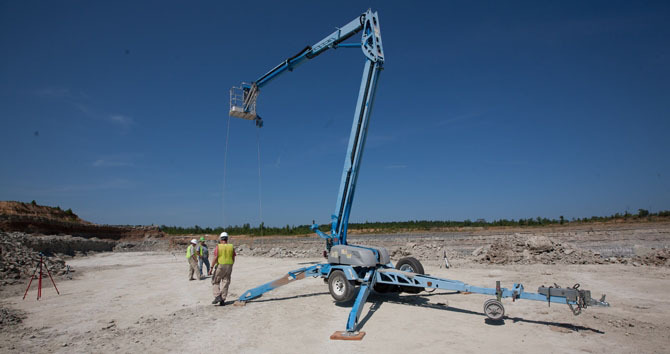 The scans will be made available to paleontologists and other interested individuals wanting to study the site so they will be able to make a virtual visit to the site without having to travel to the site itself. “Scientists can use these data to look at how the animals were moving through the area,” Boss says. “These scans will produce a comprehensive map with precise measurements of the whole site.” From this, the University of Arkansas researchers and others will be able to study various aspects of the site related to the movement of the animals over time and in relationship to one another. A glance at the computer screen under the shade of a tent reveals a surprising array of prints – more than are seen looking at the site through safety glasses. The scan on the screen confirms that the site contains layers of tracks from different generations of the animals. “The computer images of the site show detail not visible to the naked eye,” Cothren says. While the scanner takes images, the researchers remove dirt from the footprints and record their observations in field notebooks. They create a grid and photograph the site for a future photo mosaic. They sketch some areas with a marker and a plastic sheet, looking at the size of the footprints, the distance between footprints and the angles of the tracks themselves. “We don’t always know what data might be the most important,” Boss says. Later they also will take plaster casts of the footprints, a messy process, but one that will allow them to preserve the imprints back in the laboratory. Together, these processes will give the scientists a comprehensive set of data to work with. Plaster casts of a series of theropod tracks attributed to Acrocanthosaurus atokensis. Researchers from the University of Arkansas and their colleagues spent two weeks in southwest Arkansas characterizing the site where these tracks were found. In addition to learning more about the dinosaurs that walked through this area from the footprints, the scientists will be able to learn more about the environment they lived in. 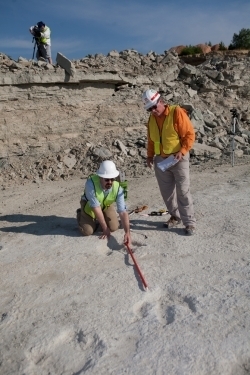 The researchers will take small samples of the rock bed where the footprints were found and look at the chemical composition of these rocks to learn about the Cretaceous. By determining the temperature and the intensity of evaporation in this region by looking at the chemical composition of the rocks, scientists can compare the information found in these rocks to those found at other sites and develop a global “snapshot” of the climate during the early Cretaceous. 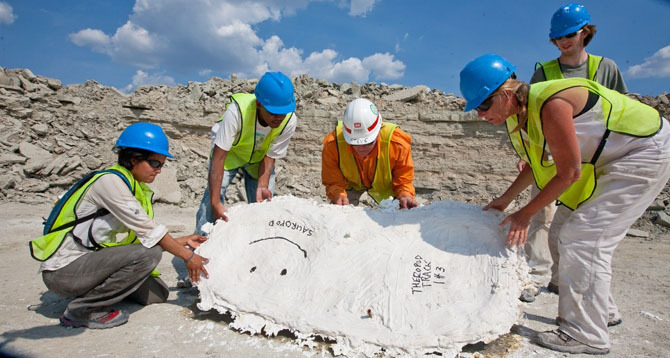 From left, Boise State University researcher Celina Suarez and University of Arkansas researchers Terryl Daniels, Stephen K. Boss and Joann Kvamme lift a dry plaster cast of a side-by-side sauropod and theropod print. “There’s a lot of post analysis that needs to be done,” Boss says. But before that can happen, the researchers must finish the tasks at hand under the scorching July sun. To accomplish this, research associate Joann Kvamme plunges her arms elbow-deep into white plaster. She moves rapidly, together with geosciences graduate student Terryl Daniels, to mix the powdery plaster with water in a bucket, stir the mixture and transport it to the designated print. Once they have it there, Honors College student Alex Hamlin and geosciences major Ryan Shell dip strips of burlap into the gooey white liquid, pull them out and slop them into the greased dinosaur tracks before the plaster begins to harden. The researchers repeat this process until they have plaster casts of about 30 different tracks. They choose these tracks on the basis of particular characteristics of the track – its size, shape or location, for instance. Once the plaster casts have dried, a team of four or five people carefully pries them up. Finally they load the back of the research van with the plaster casts, the tent and the other equipment. The two weeks are over, and it is time for the hours-long drive back to campus. For the researchers, these two weeks of hot, sweaty work in the sun represent just the beginning of the work. Back at the laboratory, they will begin to find out what they can learn from the information they collected. Even as they leave the site, excitement about the find remains high among the scientists. This particular site expands the knowledge about the geographic range and biodiversity of dinosaurs during the early Cretaceous and provides additional insights into the puzzle of global climate change.